Now, here's a bad allegory for you: Dewan Bahasa dan Pustaka, our oft-ridiculed Institute of Language and Literature (the English acronym sort of gives it away), is like the 15th Century Catholic Church. Given a mandate to encourage the use of Malay and to nurture local literary talent, it has instead misused its supreme power to crush the masses into obedience. Use the Malay language properly! - Or else. It treats its writers with disdain, refusing to allow them to own their copyright of works. It forces everyone into using a strict, formal and often dull version of the language. It's not a surprise at all that now the public image of the language and anything written in the language is seen as nothing more than a mindless snooze-fest. Enter the guys and gals behind Projek Elarti. Like Martin Luther was to the Catholic Church, Projek Elarti aims to become the thorn in DBP's skin. Last December, they finally published a literary magazine that totally goes against the parochial language rules set by DBP. In fact, the "Dissember" that's printed on the cover has the "diss" in the word highlighted in red, a not-so-subtle hint at what this gang is all about. Upon further inspection of the magazine's cover, at the top it is printed, "majalah kulturpop yang plural lagi liberal": A magazine of plural as well as liberal pop-culture. If there's anything DBP isn't, it's definitely plural and liberal. And if you still don't get it, there's the explanation at the bottom that there's "fiksyen frinjan" (fringe fiction) in the mag. Open the mag, and the first thing you see are the words "Babi Terbang" (flying pig). It's a brilliantly written editorial (I assume written by Amri Ruhayat) that is not only symbolic by putting aside the taboos of Malay culture, but also sets the tone of the sort of Malay writing that you're going to read within. Next to the editorial, on the inside front cover is printed a quote of Franz Kafka that is written in the sort of colloquial Malay that near everyone uses while speaking, but never seen in writing, because it's the sort of thing DBP abhors and would crush with a steam roller, if it hadn't already used the money to build a tower with an open book on its roof. What follows inside are articles, interviews, short stories and poems that are written in the style set by the editorial, and it makes for good reading, providing a fresh breath of air to Malay. There's lots of good reading provided by the likes of Sufian Abas, Animah Kosai, Amaruhizat, Diana Dirani, Dina Zaman and Tok Rimau. The interviews with Nizam Zakaria and Khalid Jaafar make for thoughtful reading too. It certainly is a far cry from the stiff upper-lips I seem to imagine the editors of other Malay literary mags having. It's very hard to go back to reading the likes of Dewan Sastera and Tunas Cipta (as if you were before) when all they seem to be are dull, irrelevant, and obsessed with a disturbing knack for navel-gazing. Even their paper quality is eons behind that of Elarti. After holding Elarti, all you might want to do with it is to cuddle up with it 'cos the paper quality's so good, and the layout design's so appropriate for a fringe litmag like this. It's all definitely cutting edge, bleedingly so. But for all the praise - and there's already such a lot of praise for this magazine - there are I feel a few blemishes in this otherwise quality product. I think I read somewhere (though I can't find the original post now) that the reasoning behind naming the mag "Elarti" was because it would be something you could bring along with you to read on the LRT. If that's the case, Elarti would fail the test - it's just too damn big. Don't even try reading Elarti on the PUTRA line at 8am from Kelana Jaya. The magazine doesn't deserve that kind of mistreatment. The other problem I find with Elarti is that the English articles (yes, there are some) are unnecessary, and they cloud the pool of Malay writing in the magazine. I'm all for local English writing having a place to be published but I feel that Elarti's too good a space for Malay fringe writing to scoot aside for English writing. This sort of Malay writing is special; it's a message to the purists that language should evolve and grow and bloom; I feel we should give what it deserves - a dedicated space. If anything, reading something in Malay, then English, then Malay again is the equivalent of down-shifting from 5 to 3 to 1 for me - not good. Shift-shock aside, the English stuff is brilliantly written too, especially Animah Kosai's, "The Idiot's Guide to Restricting Books". 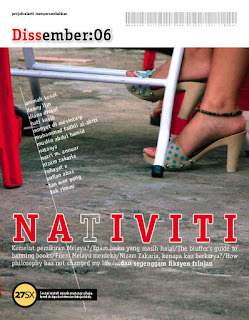 All in all, I think unleashing this mag is Projek Elarti's way of hammering on DBP's door a note of objection against its iron rule on Malay, and if we're lucky, maybe these guys can influence a reformation movement for the language. To get your copy of Elarti, I would suggest being in the Klang Valley first, and then visit these fine people. Each copy costs RM7 (er, I think.) Also, the editors are soliciting submissions for the next issue. Oh, I am so getting a copy, if for no other reason than to read Animah Kosai's "The Idiot's Guide to Restricting Books". That's what I call a damn good title. But I am curious at the Malay writing as well. I doubt I'd ever be proficient in Malay again, post-high school (aeons ago), but to read only in English would mean missing out on plenty of good local writing. Thanks for the heads up, Ted! Don't worry about your proficiency level. Just dip in and enjoy, is what I say. I don't read Malay that often, Ted, but I'll give this a go, if I - er - can find a copy. eliza - there are copies at silverfish. i also have some and we will be selling at readings too. Ted - I've been enjoying Elarti (Sharon, was very kind to give me a copy) and yes I think they should stick to Malay and not bother with the English. As a writer limited to the English language (can't blame English public school only myself), the magazine has tempted me to try to pen something in my native tongue. Elarti 2 dah kuar ke? Karang bila gua dapat gua try ulas BI dan BM. Jeng je jeng! I've read this book at a time and i love the contents of how the malaysians started to bring variations and mixtures of story to the table! Especially the 'ayat' are bit kasar however in the end, i've found the softness of the story..
Just like a mother who yelled at her son, in the end the moral is that the mother yelled at the son because of love. Rough yet soft. Sweet but enduring to read. Creative by enhancing the malaysians culture.